Singapore is again getting ready to make the world wonder. 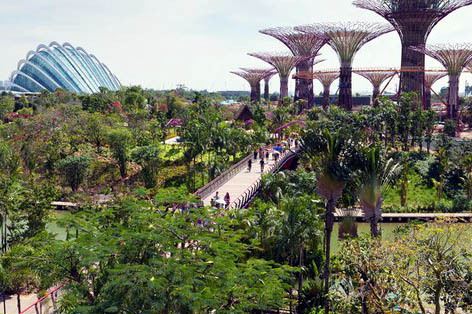 The new attraction to their already long list of things to see is the Bay South Garden located in the city's Marina Bay. This is the part of an eco-park which spreads about 250-acre (the size of 190 football fields)! This is named Gardens by the Bay. 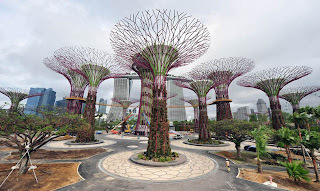 A series of the 18 gigantic super-trees that were inspired by the tallest and most dominant rainforest trees are here to attract the visitors. These trees, of 80-164 feet height made from metal, are as eco-friendly as natural trees. Their large canopies collect rain water and also absorb heat and provide shade, helping the over 200,000 species of flowers and ferns planted around and below them, flourish. Their built-in photovoltaic solar cells capture the sun's energy and provide enough green energy to power the park lights and water pumps. 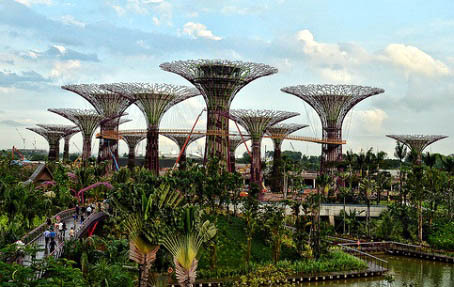 These giant trees are also linked together to form a 420-foot long skywalk, enabling visitors to stroll around and enjoy the view from the top. There is a restaurant on the top as well! This horticultural attraction, one of the largest of its kind in the world, opened to the public on Friday, June 29, offering a unique fusion of nature and technology.